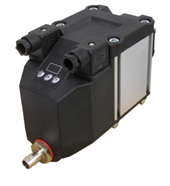 The KAPTIV removes condensate from compressed air systems based on advanced capacitive level sensing technology. The operation is automatic and there is no air lost during the condensate discharge cycle. The KAPTIV offers integrated digital programming features to suit virtually all applications, such as various alarm options, anti-air-lock/BIO versions etc. Quick disassembling modules allow for fast and simple servicing activities.